We have some exciting news to share about our presence at Golden Belt. As many of you know, DAG has maintained a partnership at Golden Belt in downtown Durham since 2011 where we have programmed Room 100 Gallery there and also operated both our Creative Mentorship Program and Artist in Residence Program from a studio there. In that time frame we have showcased 90+ exhibitions featuring 150+ local artists and served 75+ local artists through the Creative Mentorship Program and Artist in Residence Program at Golden Belt. So much creative goodness has happened in these spaces and we are deeply thankful for all the art and memories shared and created! 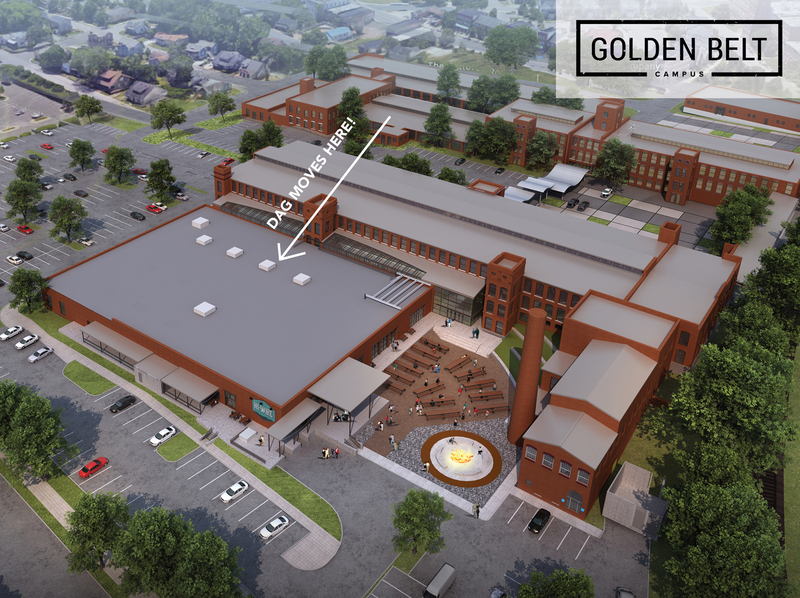 After over a year of conversations with the new owners and developers of Golden Belt, LRC Properties, and advocating for the arts within the updated plans for the complex, we are excited to finally announce that the Durham Art Guild and all the artist studios are moving to a fresh NEW location on campus. We will soon be located in the recently renovated Mill 1 Building across the parking lot behind Building 3 (where we currently are). Join us for a grand opening celebration on December 1 from 6-9pm. Our 2018 Artist in Residence, Gemynii, will be the first exhibition in DAG’s new digs. Our other new neighbors down the hall, Hi-Wire Brewing, should have their new tap room/game zone/beer garden open during the event as well! he Durham Art Guild will have our own “suite” just down the hall from the revamped artist studios area. The DAG Gallery at Golden Belt will be the centerpiece of our new area and is similar in square footage to Room 100 Gallery but with more linear hanging feet, more track lighting, and taller walls. We will also have an office, storage room and not one studio but TWO STUDIOS! Stay tuned for updates around the expansion of our programming at Golden Belt with the additional studio space. Please come visit us in our new home on December 1 and consider submitting an exhibition proposal for an exhibit here in 2019! Sneak peek the architectural renderings below.